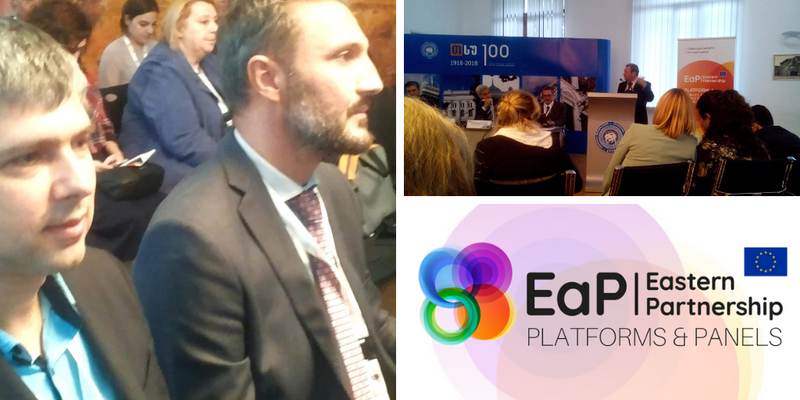 On 1 October, Eastern Partnership Civil Society Forum (EaP CSF) took part in an EaP Research and Innovation (R&I) Panel event, entitled “EU4Innovation – Fostering Research-Industry Partnerships” – under Platform 4 in Tbilisi, Georgia. Jointly representing EaP CSF, Tamaz Vashakidze (Centre of Innovative Development of Enterprises, Georgia), Oleg Shatberashvili (ESDIG – Association “European Studies for Innovative Development of Georgia”) and Volodymyr Nochvai (Civic Union “Center for innovation development”, Ukraine), presented a number of recommendations – touching on the issue of integration into European Research Area (ERA) and aligning national research systems. Despite continuous support from the EU, and access to a number of specialised programmes – including Horizon 2020 or Competitiveness of Enterprises and Small and Medium-sized Enterprises (COSME), EaP countries still under-perform in their research output. EaP CSF position paper on EU4Innovation, submitted by Nochvai and Shatberashvili, points to some of the answers to this problem. In comparison to EU countries, R&I remains under-funded in the EaP region – we read in the paper. What is more, the current government policies and strategies, adopted at the national level need to be aligned to common objectives. Currently, only Ukraine has adopted a roadmap into full integration with ERA – even though other countries could start their work on this issue, especially under the Association Agreements (AA – relating to Georgia and Moldova). Bringing the regulatory and institutional research framework closer to European standards will not only modernise the current system – it will also solve the problem of inconsistent, contradictory legislation affecting research. Over the years, this situation has lead to a “lack of efficient mechanisms of commercialising research, data and knowledge sharing”, suggests the paper. In short, “ERA integration should become the driver of R&I activities”, conclude Nochvai and Shatberashvili.